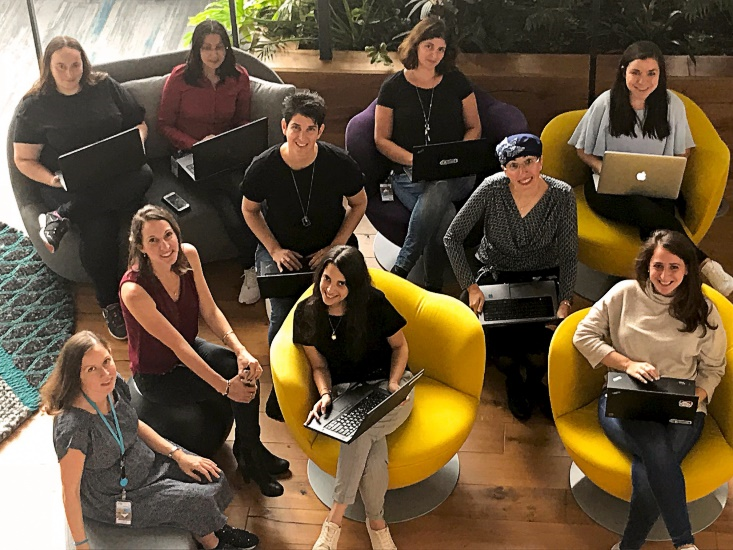 Ever wonder what it would be like to work in a development team in which most members are women? Does such a team even exist? The answers to these questions and more in this interview with Nili Adoram, scrum master of the CP Services Portals group’s Cloud Portal team in SAP Labs Israel! In the high-tech industry, it is quite unusual to see a female-majority team. How did this come about? Originally, the Cloud Portal team used to have a similar number of men and women. Then, following a reorg, some of the men transferred to another team, and another woman developer joined the team after returning from maternity leave. Presto! We were eight women, including seven developers and myself, and two male students. How did the team members feel in this new set-up? At the beginning, the women were somewhat anxious that the team was no longer balanced, both from the gender aspect as well as the technological aspect. The men who left had unique technological skills that the women were lacking. The women were not sure whether they could handle the upcoming challenges. How did you, as scrum master, handle the concerns of the team? I strongly believed in my team, and had no doubt they would succeed. However, I needed to make them believe in this themselves. It was necessary to build the team’s confidence in their own strengths, and in their capabilities to handle the complex deliveries ahead. It was also necessary to help them regain the feeling of belonging to a strong team. My management approach is to trust my team members. I find that this pays back in their proving to be worthy of my trust. In this case, the team was highly-motivated to succeed. So, in the face of necessity, each team member stepped up to the challenge, mastered new skills, and bridged the technological gap that was left by the colleagues who left, who happened to be male. It was very satisfying to see these women develop and grow, in an atmosphere of collaboration and cooperation. Our manager, Lior Lavi, was very supportive throughout this process. Has the atmosphere in the team changed? Studies show that women do considerably worse than men in IQ tests. This is attributed to the lack of confidence women have when not 100% certain, thus slowing them down, whereas men typically demonstrate determination and just charge on. Also, in group discussions where both men and women are present, women tend to be silent and let the men do most of the talking. I think that some of these behavior patterns could also be witnessed in our team’s behavior. Before, when there were more men, the women in the team were less vocal and took less initiative. Now, the members of the team discuss work-related issues with confidence, consult and support each other, and all in a positive and constructive manner. It’s not a matter of anyone’s fault, it’s simply a matter of basic human behavior and tendencies. I have learned several things. First, SAP has taught me to see change as an opportunity both for my team members and for myself, to grow and to build something new. In addition, when given the opportunity and the right conditions, women can reach new heights in their work and in themselves. However, this raises some questions, which are not easy to answer. How can SAP help strengthen women from day one, regardless of the team structure? Is there a need for specialized coaching or mentoring programs? Would it work best locally or globally? How can we make it easier for women to reach managerial positions? Currently at SAP, 25% of the managers are women. While this is an impressive number, why only 25%? Today, when people walk into one of our meetings and see all the women, they typically express surprise and admiration. I wish that in future, a team like ours will attract less attention, as it will be natural and common at SAP, and in all realms of society.